This kit pops up very often in sales, often for below $25. Here is the official description from Dragon. It’s a more advanced kit so perhaps that’s why people weren’t biting. The kit is relatively recent (2015), but in fact is a slightly updated version of 6596 and 6500 which were the original ones with zimmerit. This version just added the bits of command pieces, and apparently the T sprue is new. 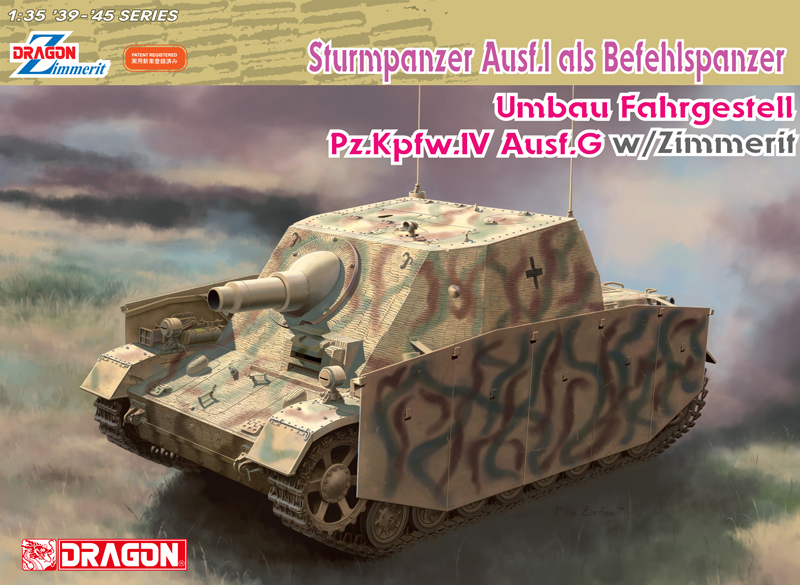 It says “ausf. G” so I’m probably wrong, but I wasn’t able to find an earlier kit with this sprue. And of course they replaced the original Magic Tracks with the crappy DS. They did something puzzling which almost caused me to send a “missing sprue” message to their customer support. I don’t know how they do this, but it turns out you’re given 1.5 T sprues. 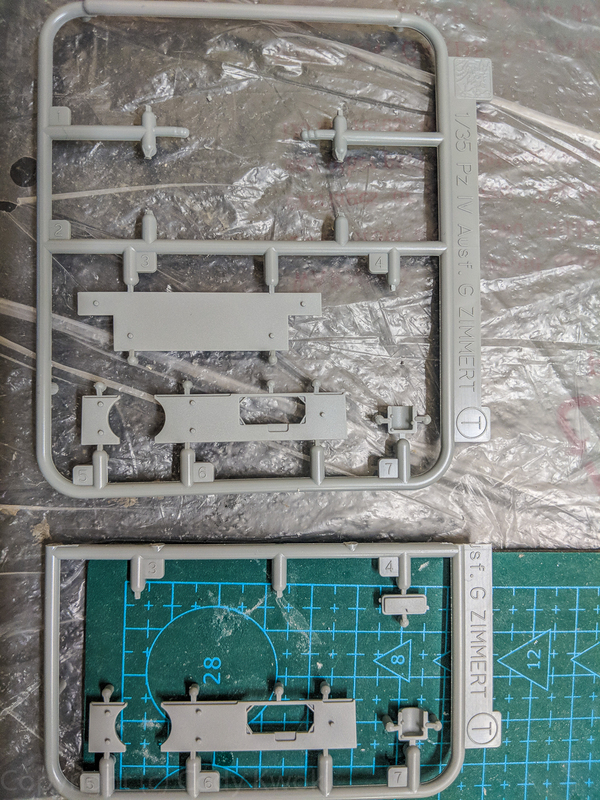 BUT this half T sprue isn’t the same as the other, here the piece T3 is actually molded with studs on the zimmerit, and the other one doesn’t. The instruction call this T3 “t3”, but it actually lives on this half T sprue. Now that I have all the pieces I began to assemble. Incidentally I read the excellent build review of Adam Mann and his video which was very helpful in a couple of spots. In step 1 they ask you to cut this 9mm section off of the lower hull. It doesn’t need to be precise, it was done to give the support platform some clearance later. They ask you to make assembly E of 6 tiny parts, but I couldn’t find any place that uses them so I ignored it. In step 2, the T sprues were confusing the heck out of me but I finally figured out which piece is which. The T1 sprue that has zimmerit looks a little suspect as you’re asked to put t3 on top of it, but it is the right piece. The rest of the hull steps 3-5 are a breeze and the fit were really good. The bogies fitted right into A38. They ask you to fill the holes in step 4, I pushed putty through the back of the holes to minimize their presence, since the place has zimmerit details. The clip subassemblies using MA1 and MA2 were tricky but not too difficult, just fold MA2 carefully (I got it wrong a couple of times) and MA1 has a tiny slot to go in. I wasn’t sure MA1 is a single piece or should you glue to pieces of them back to back, since they only have details on one side. But the slit at the tip of MA2 is only wide enough for one MA1. In step 7 you’re asked to do some cutting. The cutting diagram shows 2 sequential cuts, it wasn’t clear it was asking you to cut both E2 and E1 or just one, but in retrospect it has to be done on both. It looked daunting with all the measurements, but in fact it was quite easy. The middle section is just the raised edge of the piece and you just needto trim it off. The 0.3 mm, if you measure it, is almost where the rivets are, so you can just sand off the ledge right by the rivets. In step 8, They have you do this complicated F36/MA5/MA4 subassembly. If you choose to use the toolbox as they asked you to in step 12, then don’t add this as it sits right there. You can add some tools there I think instead of the toolbox, in which case I suppose you can keep this subassembly. In step 10, the H38/F30 subassembly is a little difficultto visualize due to the very complex shape of H38, but it is supposed to be vents pointing downwards. One thing that is helpful with Dragon’s confusing instructions is you often can find a later diagram that shows how the assembly was supposed to be. 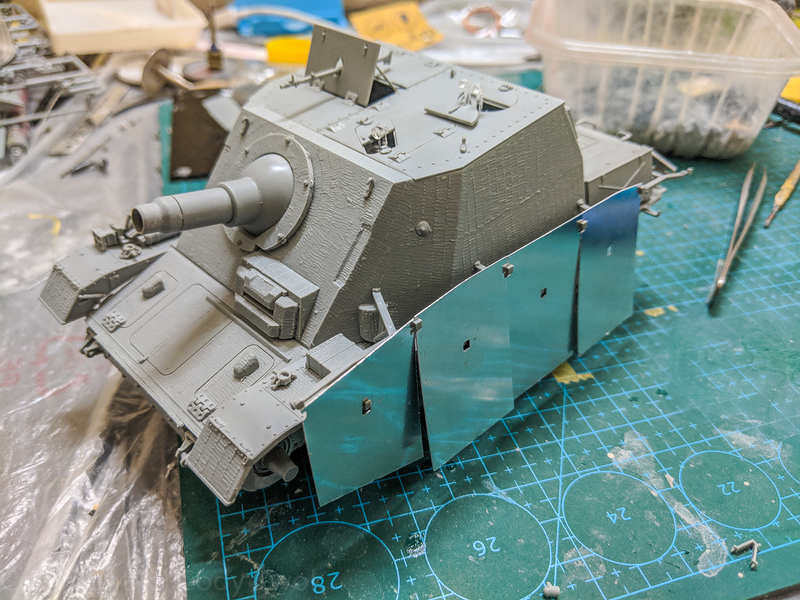 I was building the Ryefield Model’s Panther G with interior and many of the confusing steps didn’t have a follow up shot and there were lots of guesses. Moving onto step 11, the armor panels can be opened or closed. The periscope from the gun sticks out of the round hole between E11 and 12, so you may want to leave them off for now lest you may have fit problems later. On to the upper hull. The zimmerit surface have a number of missing holes for pieces to anchor, which means you have to be careful in anchoring them. In step 13 C20 needs to have their pegs cut off so that they can be glued directly on top of the zimmerit. Quite important here is to make sure E20 fit the upper hull. I discovered later that there was a seam at the bottom that is very visible in the final kit, so you want to make sure you glued down E20. In step 14, I suppose the complex diagram around G19 with all the icons means you can choose to cut off the little details around G9. I chose to keep them. Also here G19 doesn’t look like that. G19 is the zimmerit version of an equivalent item (sorry forgot which one), but G19 itself doesn’t have the tail portion for you to stick the chain on. I did some surgery to give the tail to G19 from the other item. The gun assembly steps 15-17 are straightforward and gave a pretty detailed gun. Step 18 has some extra option for G7, didn’t understand it at first, but in the pictures G7 is an additional lower lip for the vision port. Adam didn’t like the roof assembly, but mine fitted very well. Use some quick setting glue to join the lip between the front upper hull and the roof and it’ll be finely enclosed. Ok we’re near the end. I debated whether I want to attach the subassembly like they suggest in step 19, or glue subassemblies G and H to the lower hull first. But in the end doing it like they do is the right approach. With a little wriggling I could get the upper and lower hulls to fit very well, and the rear engine deck as well. There is a bit of a gap with where the rear engine deck meets the upper hull, but looking at pictures that seems to be expected. Finally step 22 fitting the side skirts… oh boy. First another wrong part here, it’s not part C5 or C4 in steps 22 and 21, it was the zimmerited G14. The anchor holes for the skirt rail mounts are not on the zimmert hull so this is a lot of measurement. I recommend this sequence: first glue F21 onto F42, and F10 to G14 (which replaced C5). Before F10 is completely glued, gradually mount MB2 onto the hook on the upper hull. Each schuzen has 3 mount points, the middle, and the two openings that fits pegs on F42. So you want to first fit the middle hole that is well-anchored, then position F42 so that MB 2 can be comfortably seated. Then glue the F21 closest to MB2 to the upper hull (you already have glued F21 onto F42). With the glue dried a bit but not completely set, repeat for MB3. This was a bit frustrating as MB2 and MB3 kept moving and popping out, but if you had F21 dried some you should have some good anchoring to keep MB2 in place. Once you also have MB3 seated glue the other F21, and basically F42 is anchored. Mount MB4 to check that it all works. Next you go back to F10 and attach it to the now anchored F42. Mine didn’t fit so I needed to bend it some, so it helps if you glue isn’t completely set. Mount MB1 to check. Finally MB5 should also mount with no problems, but F8 does not go where the instructions tells you to. In fact if you look at the drawing it has no tool box! There is a small hole near the rear so that’s the right place to mount it, but the strange thing is while F7 has no problem being mounted because the lower arm still touches the engine deck, F8’s arms are wider and the lower arm goes into the vent. I’m not sure what to do here, I suppose if I cared I’d do some surgery to turn F8 into F7, but I didn’t so the lower arm just floats. Alright so that’s that. In Adam’s review he mentioned that the schuzens are not able to fit together, but I think mine works ok. That’s just a guess, I’ll know for sure when I do final finish on the kit. I’ll likely drop one or two pieces anyway to show off the tracks a little, so it’s moot. Conclusion: Another nice Dragon kit. I like their kits quite a bit now because their molding is very crisp and I really like their plastics. The details are great and getting through the terrible instructions gives you a sense of satisfaction. 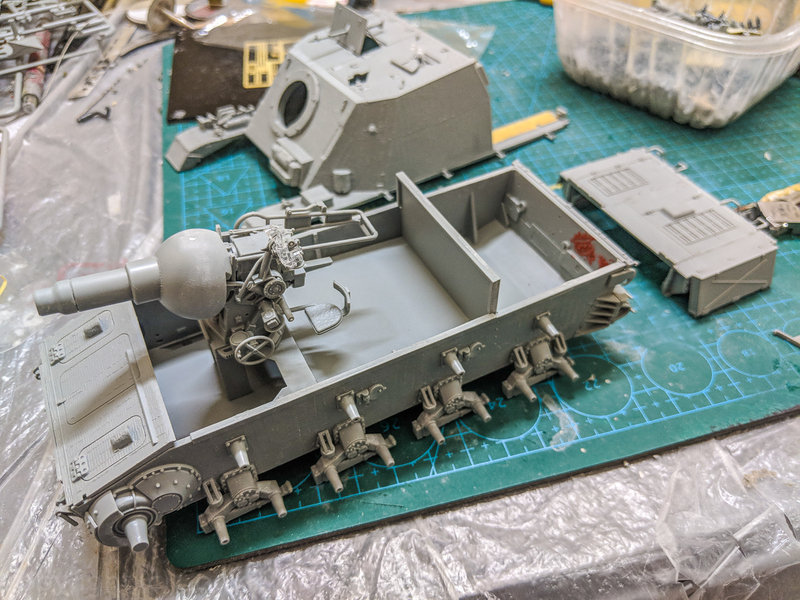 The zimmerit looks good on the kit and I look forward to painting this one day.